Easter commemorates the most important events in human history—the death and resurrection of Jesus Christ—and it offers us the chance to renew our relationship with Him. 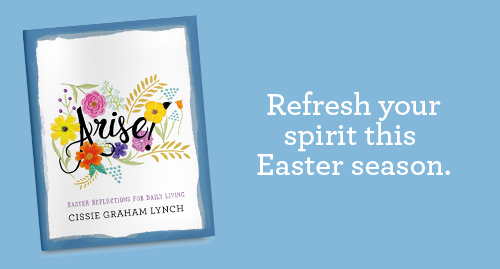 In Arise!, Cissie Graham Lynch—daughter of Franklin Graham and granddaughter of Billy Graham—invites you to take a closer look at the last days of Jesus’ life and discover how He gives us the strength to boldly live each day for Him. Selected Scripture readings, powerful Biblical reflections, and meaningful prayers will help you focus your heart on the hope found only in Christ. When you fill out the form below, you’ll receive your free electronic copy of Arise! : Easter Reflections for Daily Living. We’ll also send you regular updates on the work God is doing through friends like you and the Billy Graham Evangelistic Association. Yes, I want to receive Arise!